Eagles fans at Lincoln Financial Field and everywhere had a long night watching the season-opening win over the Atlanta Falcons. In the film Bull Durham, the goofy pitching phenom Nuke LaLoosh trots into the dugout, pleased as punch with himself after throwing a 1-2-3 half-inning. "That was great, huh?" he asks his catcher and mentor, Crash Davis. Davis is not so pleased. "Your fastball's up. Your curveball's hanging," he says. "In the Show, they would have ripped you." LaLoosh is dumfounded: "Can't you let me enjoy the moment?" Davis instead delivers a hard truth. 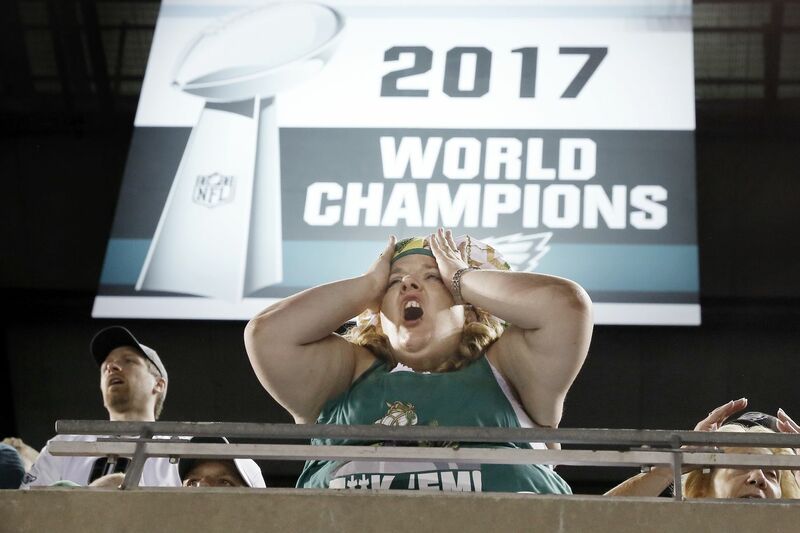 At 7:53 p.m. Thursday, while the night still had the feel of a rain forest, the Eagles' flashed a message on the two giant videoboards at Lincoln Financial Field, asking fans to retreat from the stadium's open-seating area. At 7:58, the sky indeed opened up in a brief but torrent storm. (Hey, the Eagles won the Super Bowl. I'm surprised there weren't locusts.) In turn, the NFL and NBC agreed to delay the evening's festivities. The Eagles' pre-game unfurling of their Super Bowl banner, which their marketing staff designated the team's "championship moment," was pushed back to 8:45 p.m., and kickoff of their game against the Falcons would be 20 minutes later, at 9:05. So along with celebrating their first NFL championship in 57 years, the Eagles apparently hoping to set a record for the longest moment in world history. They had emcee Brian Dawkins screaming and owner Jeffrey Lurie toting the Lombardi Trophy onto the field and a humongous replica of the trophy at the 50-yard line and fireworks machines spitting out golden sparkles. It was as if they and their fans were determined to wring every last drop of joy out of that February night in Minneapolis, and as it turned out, Mother Nature was happy to help. Then the game began, and within the hour, those same fans were booing, and it was tough to blame them. The Eagles had as many net total yards at the end of the first quarter as they did at its start, and they were on their way to an 18-12 victory in which they committed 11 penalties and two turnovers, gave the Falcons a gift possession when a punt caromed off special-teamer Tre Sullivan's foot and an extra shot at the end zone when Jordan Hicks was guilty of illegal contact on the game's penultimate play, and needed Doug Pederson to use a variation of the "Philly Special" just to give them and their home crowd some juice. If you were inclined to believe the warnings that Malcolm Jenkins and Chris Long had offered during the preseason — that the Eagles needed to cast any memory of Super Bowl LII out of their minds and get good and girded for this new season — were warranted, Thursday lent some validity to your concerns. "They understand this is a different season," Pederson told reporters Tuesday. "It's a new team, new year. … They have moved on. It seems like these events sort of keep popping up for us to sort of reflect, which are great. I love them because we're all part of it. But here's still a bunch of guys on this roster that didn't go through that. I think the team mentally is in a really good spot, focused on, obviously, the game, focused on the opponent." They did not play, for the most part, as if they were, and their sloppiness, which struck such a sharp contrast to their alacrity last season, was a reminder of the difficult task they face over the next four months. Yes, Carson Wentz and Alshon Jeffery will return to the lineup eventually, and Nigel Bradham will be back next week, and Zach Ertz is unlikely to drop three passes in another game this season — let alone three in a quarter, as he did against the Falcons. But the NFC is better this season than it was last season. Aaron Rodgers is back for the Packers. The Saints still have Drew Brees. The Vikings now have Kirk Cousins. The Rams are loaded with talent. And the Falcons showed Thursday that Matt Ryan and Julio Jones are as formidable as any quarterback-receiver tandem in the NFL, even with Steve Sarkisian as their play-caller, even when Ryan has an awful night. Because the NFC is better, the Eagles will likely need to be better, not necessarily to win the NFC East, but to reach the standard that they established for themselves. "The new norm," as Pederson called it. They struggled to meet that standard Thursday night, and they were fortunate to do so. They're 1-0, barely, and the moment, finally, is over. They enjoyed it, but it's over.